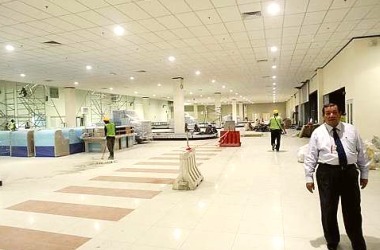 THE new international arrival hall at the Low-Cost Carrier Terminal (LCCT) at Sepang in Selangor will open for operation on Dec 15, weeks ahead of its original scheduled date. The hall is part of the RM160mil new wing constructed under the LCCT expansion plan. The whole wing is also expected to be fully ready for operation earlier than the original completion date of March 15 next year. According to Malaysia Airports Bhd (MAB) senior general manager (operations) Datuk Azmi Murad, the extension would add 32,000sq m of additional floor space to the existing 28,000sq m available. 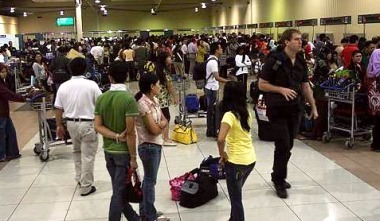 “The check-in counters will be increased from 72 to 117 for a smoother passenger flow. The counters usually handle 600 passengers per hour but will soon be able to handle 2,200 passengers an hour,” Azmi told StarMetro. “The grand total of six baggage carousels will save passengers’ time,” he said. “With the additional floor space, we will accommodate more retail and F&B outlets, and shower and surau facilities,” Azmi said. The expansion was implemented following the tremendous increase in passenger load at the LCCT soon after its opening in 2006. By last year, the LCCT was operating beyond its originally planned capacity of 15 million passengers a year. Azmi said the new wing could help cope with the 34% growth because once it was fully operational in March next year, the extended terminal could serve 30 million passengers a year. Besides the AirAsia domestic flights and the AirAsia X international services to Thailand, Indonesia and Australia, the LCCT also caters for the Cebu Pacific Airways of the Philippines and the Tiger Airways of Singapore. “We handle 30,000 passengers daily on regular days but during festivals and school holidays, there is an increase of 30% in passenger load. With the new wing, we can cater for more airlines,” Azmi said. AirAsia X, meanwhile, is scheduled to start operating the London Stansted-Kuala Lumpur route from the LCCT in March next year. According to LCCT-KLIA manager Raghbir Singh, measures taken to cope with the surge in travellers during peak seasons include extending the waiting area at the present terminal. “By taking up the service road previously used by taxis, we have a 3,000sq m frontage for a bigger waiting area with 600 seats,” Raghbir said. According to Azmi, to ease congestion at the present departure hall, passengers are only allowed to check in once their respective counters are opened. The others have to wait at the seating area. At present, the MAB is toying with the idea of a mechanical carpark because parking bays will soon be limited once the new wing is fully open. With air fares increasingly becoming cheaper and competitive, resulting in the healthy increase in passenger load, Azmi does not discount the possibility of his company building a permanent and larger LCCT. “Our holding company Malaysia Airports Holding Berhad (MAHB) owns 100sq km of land in Sepang. So we have enough space for a permanent terminal. “We have a few locations in mind,” he said. He also said if AirAsia did succeed in building its own low-cost carrier terminal, the present LCCT could be converted into a cargo warehouse or for other purposes.